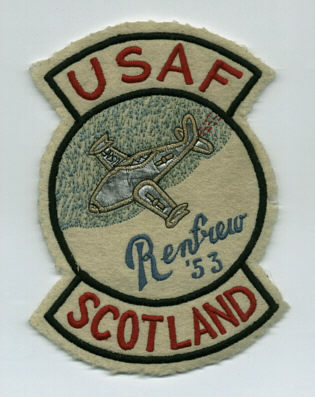 Bill Wilson supplied this picture of a patch that was issued to all Airmen that went TDY from Burtonwood to Renfrew in Scotland. Does anyone else have one of these or even recognise it? A follow up to this item came in the form of an email from Ron Klein who claims not only to have the patch but also the jacket to which it is sewn. I would like to know if it still fits!